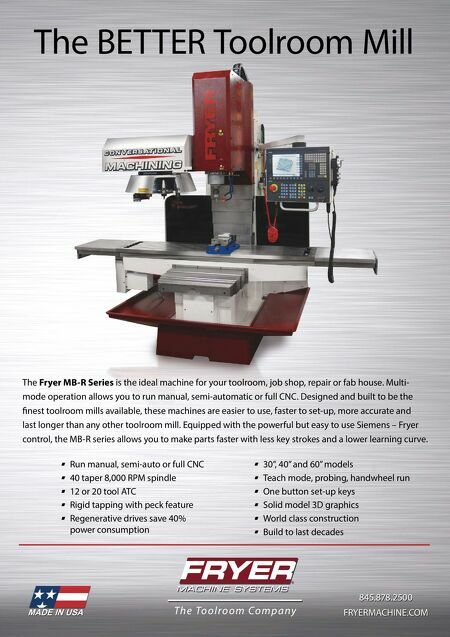 28 MMS March 2017 mmsonline.com RAPID TRAVERSE Machining Technology in Brief Remote Honing Analytics with MTConnect-Compliant Machines BY D E R E K KO R N Digi-Pas USA LLC, call 860-373-9634 or visit digipasusa.com. Hurco Companies Inc., call 800-634-2416 or visit hurco.com. needed. The company says the instrument's accuracy is ±0.001 degree between 0 and ±2.0 degrees, and ±0.003 degree at other angles. Repeatability is 0.001 degree, as is resolution. Using a connected laptop to display data (which can also be seen on the device's LCD screen), Mr. Schmedake didn't have to get up and down from the floor as frequently to level a machine, and soon found that he was saving an average of four hours per installation. Bluetooth connectivity means the data can also be seen on a smartphone or tablet through an app. M i n g Yo n g, v i c e p r e s i d e n t o f s a l e s a n d marketing for the Digi-Pas line in North America, says the same kind of ease-of-use features make the device handy for users of machine tools as well. The company says its digital levels are regularly used in applications such as: • leveling jigs and fixtures • aligning and orienting machine components during setup or repair • leveling CMMs • m e t r o l o g y, i n c l u d i n g m e a s u r e m e n t o f finished parts. The device's built-in vibrometer also makes it useful for detecting machine vibration outside o f a n a l l o w a b l e r a n g e, w h i c h m ay i n d i c a te worn or misaligned components. The device's software and app can export these readings to an Excel sheet to enable tracking vibration data over time. Sunnen's MTConnect-compliant machines offer communication capabilities to gather data to more effectively evaluate overall equipment effective- ness (OEE), future maintenance needs, process performance and other key metrics. MTConnect is the open-source, royalty-free communication protocol designed to make it easier for machine tools and other pieces of shopfloor equipment to "talk" to one another and to other computer programs that process shop data. Sunnen says it of fers the industr y's first MTConnect-compliant smart honing machines capable of communicating process analytics to other devices. This was demonstrated at last Sunnen offers what it says is the first line of MTConnect-compliant honing machines to enable shops to more effectively gather data to evaluate overall equip- ment effectiveness (OEE), maintenance needs, process performance and so on.